I knew it was going to be good before I even saw the first exhibition. The security guard was smiling right from the deeps of his eyes, and he was courteous and friendly from all of 10-feet away. This is a good sign anywhere in the world. The Islamic Arts Museum Malaysia, in Kuala Lumpur is infused with respect. Despite having travelled through many Islamic states and nations in the world, I now realise I have never considered the religion on a truly global scale, only as individual fragments. This was no mistake on my part, as with all religions there are subtle variances on the theme. 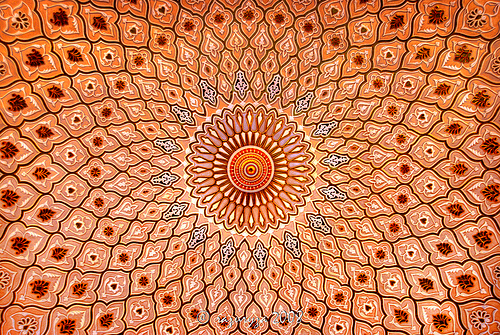 What the Islamic Arts Museum Malaysia (IAMM) does very well, is to open your eyes to intricate detail of the Islamic art, and the relevance it has within the religion today. It shows no bias, therefore the exhibitions incorporate artefacts from China, India and Southeast Asia, as well as the more famous regions of Iran and the Middle East. The exhibits take centre stage in a spacious (30,000 square metres) white building, complete with some of the most absorbing ceiling domes you’re ever likely to see; and you should know, I am not one to flippantly comment on ceiling domes. The IAMM remains my top attraction for Kuala Lumpur, and you’ll need to be in the right frame of mind to delve through the torrent of education. At the time of my visit, an exhibition called Treasury of the World was on display, showcasing a large amount of jewelled items from India’s Mughal dynasty. The period was one of India’s most prestigious, and led to many of the most famous sites in the subcontinent today. The tales of the Mughal empire are reason alone to visit India, and this exhibition reminded me of many of the stories which riddled my time in the country. Perhaps my favourite exhibition was the display of Islamic architecture, featuring small scale recreations of most of the world’s most important mosques, including Saudi Arabia’s Al Haram Mosque in Mecca, and the Prophet’s Mosque in Medina, as well as India’s famous Taj Mahal in Agra. Seeing this collection together under one roof gave me a palpable sense of the importance these buildings have to Muslims around the world. For example, I had always thought that Muslims prayed towards a specific cardinal point, and I now realise they pray towards the Kaaba, a large granite and marble cube, believed to have been built by Abraham and his son Ishmail. The Black Stone, as it is commonly known, is the very reason for the existence of the aforementioned Al Haram Mosque in Mecca, but for me the most powerful image in my mind was that of the world’s 1.5 billion Muslims who turn to face the Kabba five times a day (well, those that follow the religion to the max). Imagine that from a bird’s eye view, next time you’re peeking into a mosque beneath the enchantment of the Call to Prayer. I peered into brightly lit glass cabinets, displaying intricate reproductions of the Qur’an, or perhaps an arsenal of weaponry more likely associated with the Mongols. The IAMM displays carved wooden doorways and finely stitched cloth work within shouting distance of interesting metalwork, and the history of Islam in the Malay world and beyond. As I conclude this post, you should know that I still know hardly a thing about Islam. The same goes for all of the major religions and philosophies. My attitude towards religion can vary dramatically: some days I blame it for pretty much everything, but then I come across a temple, a mosque or a church, and I feel what it means to its followers. It becomes much more than a headline-maker. Like a butterfly swerving the rain, religion can be one of the most beautiful aspects of a culture, and in turn its people. I recently had a telephone conversation with a Wellington-based Hindu whom I met via Twitter. I asked him to explain Hinduism to me, and if there were any aspects I could bring into my own life. We talked for an hour, and he explained that most of the attendees at individual temples in Wellington come from the same Indian villages, and as a result, the community remains tight. He left me with a list of internet resources, and I’m yet to look at any of them. Something tells me I’m not quite ready to face it. Meanwhile, I’m happy being an observer, and a large part of me believes I always will be. As I walked out of the Islamic Arts Museum Malaysia, the affable security guard threw me a blinding smile; I turned to him and shook my head, “Amazing,” I said. He gallantly nodded in agreeance, then opened the door and watched as I returned to the balmy midday heat of Kuala Lumpur to continue my exploration. I had no idea where I was going next, and little idea of where I had just been. The Islamic Arts Museum Malaysia is open every day from 10am – 6pm and is located on Jalan Lembah Perdana, relatively close to the National Mosque and National Museum. Entry costs RM12 (£2.50) and you should allow for at least 2-3 hours. Photography is prohibited throughout the museum. I actually found the Islamic Arts Museum by accident when I was wandering around Kuala Lumpur in search of the National Mosque of Malaysia. The exterior of the building was awesome, and instantly grabbed my attention. Unfortunately, I didn’t have enough time to go inside the museum, but I did take a few pictures of its exterior. My pictures are on flickr if anyone is interested: http://www.flickr.com/photos/[email protected]/5043527423/in/set-72157624630903558/. Thanks Kassim. If you’re ever in Kuala Lumpur again you should definitely make a point of visiting. So many interesting exhibits and artefacts. Thank you for the great piece about the Islamic Museum. I am visiting KL in two weeks time and was told its a must visit. Thats when I started a bit of research on the net. I am so looking forward to it. I am Muslim and I am Malay. So it will be great to explore there. I will post a comment after my visit. You’ll have a great time, Jamela. We’re looking forward to hearing how your visit went. presentation topic, which i am going tto convey in school. includes plenty of helpful facts, thanks for providing such data. Thank you for all of the effort on this website. Betty take interest in engaging in investigations and it’s really easy to see why. Almost all hear all about the compelling ways you make informative tips by means of your web blog and as well cause contribution from visitors on the idea so our simple princess is always understanding a lot. Take pleasure in the rest of the year. You are carrying out a brilliant job. I happen to be writing to let you understand what a superb discovery my wife’s daughter enjoyed browsing your web site. She picked up too many pieces, which included what it is like to have an ideal helping mood to let other people without hassle understand certain tricky topics. You actually exceeded my expected results. I appreciate you for displaying such interesting, safe, explanatory not to mention fun tips on that topic to Sandra. I simply wanted to write a quick comment to express gratitude to you for those nice tricks you are posting at this site. My time-consuming internet search has at the end been compensated with extremely good know-how to write about with my partners. I ‘d claim that we site visitors are undeniably endowed to be in a useful site with very many wonderful individuals with beneficial tactics. I feel really blessed to have discovered the web page and look forward to many more thrilling moments reading here. Thanks a lot again for everything. I wish to show appreciation to the writer for bailing me out of this problem. As a result of scouting throughout the internet and getting concepts which are not beneficial, I thought my entire life was done. Existing without the presence of approaches to the difficulties you have solved by way of this blog post is a critical case, and ones which may have in a negative way damaged my entire career if I had not encountered your web blog. Your expertise and kindness in controlling all the details was invaluable. I don’t know what I would’ve done if I hadn’t discovered such a point like this. It’s possible to at this moment relish my future. Thanks so much for your professional and amazing help. I will not be reluctant to refer your web site to any individual who needs to have guidance about this issue. I as well as my pals were found to be digesting the great guidelines on your web blog and then all of the sudden got a terrible feeling I never thanked the website owner for them. The men happened to be for this reason warmed to read through them and have now in actuality been taking advantage of them. Thank you for genuinely quite considerate as well as for making a choice on some very good resources millions of individuals are really desperate to discover. My personal honest regret for not expressing gratitude to you earlier.